William Mager’s post on the Ouch! blog this morning deserves a read. Part of the commemorative events to mark the 100th anniversary of the UK’s entry into World War One, it highlights the ‘Untold Stories of Deaf people’ who enlisted, worked, farmed, and supported Britain through Wartime. Deaf people walking along the road were told to stop by sentries. But when they continued to walk, they were shot… There are a number of stories about deaf people being randomly shot while walking home from work, cycling or generally getting on with life. by September 1914, the British Deaf Times had published a set of guidelines warning its readers not to go out walking alone or near railway lines, stations and public buildings, and advised they be accompanied by a hearing person where possible. You think it only happens in the States? That same article contains links to a second instance in which a Deaf ASL user was held in a choke hold for attempting to communicate. Perhaps you can be forgiven for thinking it’s OK to shoot, electrocute, or choke someone in wartime. But now? Or does it suggest that, perhaps, we in the West (at least) are not, in fact, living in a period of peace, but rather that we have allowed war to so permeate our every day lives that anyone who fails to fit to a very tight definition of ‘normal’ responses – deserves nothing more than death. Like it’s somehow ‘their fault’. They were Deaf… now, because they were Deaf, most of them are Dead. 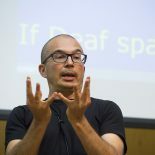 Deaf Studies, or any ‘Studies’ that highlights the importance of the diversity of humanity has never been needed by our society as much as it is now. This entry was posted on November 4, 2014 by Mike Gulliver in Musings.